Are you tired of struggling with your computer? Do you wish you knew how to get the most out of your computer investment? Allpro Technology has been offering computer services in the Greater Lake City Area for over ten years. 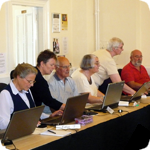 For years our customers have suggested that we offer basic computer training so they can stop struggling with their computer and start benefiting from it. We are proud to now be offering computer classes at our office. We are now equipped to offer classes to five individuals at a time. This allows us to provide personalized training at an affordable cost. We offer courses ranging from the most basic computer skills everyone should know to intermediate software training. View our Lake City Area Computer Training web site for more information.